PIETRE AL MONTE GRAN RISERVA: Pietre al Monte’s signature Gran Riserva extra virgin olive oil is made with only the best selection of hand-picked olives specially curated from the Il Paretajo estate located in the Chianti Colli Aretini region of Tuscany. The single estate olives are cold-extracted within hours of harvesting and are carefully selected by their experts depending on the quality and taste during each harvest season. The resulting oil is typically dark green in color with a delicately balanced flavor of green olives, fresh herbs and tomato. Prized for its incredibly fresh and signature peppery flavor with a high concentration of polyphenols, this oil pairs excellently with shellfish, grilled vegetables, legumes and carpaccios. 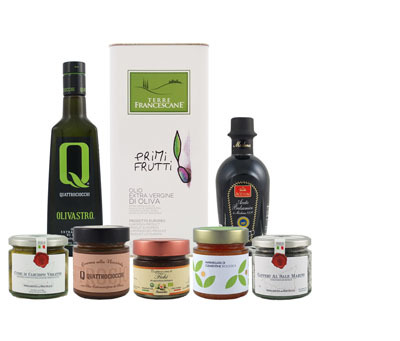 PRUNETI LECCINO BIOLOGICO: A monovarietal extra virgin olive oil from Frantoio Pruneti pressed from 100% Leccino variety olives grown in the Chianti area of Tuscany. The delicate oil that comes from the Leccino olive is often covered in the Tuscan blends by varieties that are more bitter and spicy, thus providing a wonderful opportunity to taste the Leccino olive with all of its delicate but wonderful characteristics. Its notes are of fresh grass, parsley, chive, celery and green apple with a soft but persistent sensation of wild asparagus. This oil is not too aggressively bitter or spicy and has a simple white pepper finish. FRANTOIO FRANCI VILLA MAGRA: One of Frantoio Franci’s most awarded oils from Tuscany, this extra virgin olive oil is intensely fruity with aromas of green olive with fresh and pungent grassy notes with hints of artichoke and elegant notes of roasted coffee. Its taste is powerfully fruity, fresh, grassy, pungent and complex, yet harmonious and well-structured with a fresh, rich finish of spicy grass. Use this oil fresh in soups, on boiled or raw vegetables, bruschetta, red meats, tomato salads, with plain rice or pasta, as well as well-matured cheeses.